“Art is magic,” says artist Terry Zarate. Zarate finds inspiration for her painting from her muses – cats, the moon, mythology, women, and trees are but a few. However, she also sees her art as a more profound concept than just painting a pretty picture. “My art is a total all-consuming part of me. I cannot imagine a life without art,” she said. Many of her ideas and inspirations come from dreams and visions during periods of meditation. Though she prefers working in oil, Zarate also works in pencil and watercolor..
Zarate has devoted her life to creating and sharing her work with the world. She has been included in many juried exhibitions, worked on commission, and had one man shows in galleries, libraries, and the Vada Sheid Community Center in Mountain Home, AR. “I work every day in my art,” she says. “Creating art is spiritual to me. I feel so fortunate to be an artist.” Zarate has won awards for her art and is included in the Arkansas Artist Registry. Terry Zarate’s work can be viewed and purchased on her website: www.dreamworldsart.com, And her work can be seen in her studio and home gallery by appointment to anyone interested – 870-453-6123, tlzarate@flippinweb.com. Her favorite subject is people portraits, with her Personality Plus Portraits, that include or depict something that the person enjoys. She works in all media and she enjoys all subject matter and does all types of commissions. She has participated in several one person shows including an exhibit at the Hill Country Gallery and a previous ORAC sponsored exhibit at the Vada Sheid in 2012. She has participated in the Art Odyssey Studio Tour in 2012 and 2013. She is a member of the National Oil and Acrylic Painter’s Society, White River Artists, Palette Art League and Ozark Regional Arts Council. Local area artist Ara Banks art is a celebration of life and color. Each piece she develops is an experiment in expansion of the use of materials. While others have shared their analysis of her paintings Banks is more intrigued with the idea of stories developed from the paintings as every person she tries to capture indeed has a story to tell. Several of the artists contributing to this month-long exhibit were: Terry Zarate, Janet Emery, Sandi Barksdale, Deborah Lively, Marty Mace, Cynthia Malenshek, Elfriede Bower, Joyce Hitch, Karen Jones, A.J. Cantrell, Edith Thornburg and James Bell. The exhibit includes paintings in watercolor, oil and acrylic. Also exhibited are weaving, stitchery and embroidery. Twenty nine member artists who contributed to this month-long, multi-art exhibit were youth artists: Hunter Watson, photography, Noelle Ballor, paste, Lillie Ballor, pastels and clay, Nicholas Nantz acrylic, Alexa Sonnier, polymer clay figurines, Meagan Sonnier, painted rock and Aimee Raines, drawing; Missouri Best of Missouri Hands artists: Louise Walker, pottery, Regina Robertson, mixed media, specialty turkey feathers, Elizabeth Brown, Eliz Arts, multi-media, Celeste Prussia, specialty pottery; Oils/Pastels/Acrylic/Pencil artists: Donna Howard, Rita Fancher, Margie Smith, Jimmie Marler, Deb Lively and Candi Butler; woodwork/carving artists: Harry McBride and Bev Vyskocil; jewelry: Ann Roberton, beading, Liz Jenkins, wire wrap, Vivian Haynes and Bev Vyskocil; fiber arts: Kathy Reser and Kitty Descoteau; photography/etchings: Richmond Smith, Teresa Dooms and Ana Felix; and metal: Jim Davis. Carol Tormey Jones studied her art at the Art Students League, in New York City, at the University of London’s Sir John Cass College, and at Royal Academy. One-woman and joint shows include the Country Art Gallery, Long Island, NY; The Noisy Oyster, New York, NY; Palm Beach Gallery, West Palm Beach, FL; The Black House, Searcy, AR; and the Cleburne County Arts Council, Heber Springs, AR., Arts and Science Center, Pine Bluff; Wings Over the Prairie, Stuttgart; The Palette Art League, Yellville; and The Casements, Ormond Beach, FL. Art publications include The Art and Artisans of the Ozarks, Volume I; Animal World, Daytona Beach, FL, and The Sensuous Carrot, an artists’ cookbook with The Country Art Gallery. Jones has permanent collections at the University of Arkansas, Pine Bluff; The Donald W. Reynolds Library, Mountain Home; and Shea Stadium in New York City and Jones’s paintings are in private collections around the world. Jones writes and illustrating children’s books featuring “Princess Paisley,” and “Busy as a Bee.” Jones is the creator of the “Storybook Chair” at the Donald W. Reynolds Library. According to art instructors Beth Ivens and Christy Lawrence, the students, all MHHS sophomores, juniors and seniors, were enrolled in Art I through Art IV classes. The exhibit included works in Batik, oil, pastel, watercolor, color pencil, mixed media and pencil. Exhibiting art students were seniors Tyler Miller, Trevor Baugh, Olivia Wakenight, Jackson Schmitt, Stacy Chen, Hannah Chapman, Alyssa Miller, Rebekah Kellum, Edward Lopez, Brittany Sims; juniors Faith Serrano, Shayla Wells, Monica Vasiloff, Steven Switzer, Kaden Harris, Savannah Babington, Rachel Arp, Katie Hutcheson, Tamisha Hickman, Grant Conner, Jessica Harrison; and sophomores Hank Lawrence, Brandon McMaster, Ryan Pevril and Summer Webers. The exhibit featured over 40 paintings by Duane Hada’s watercolor students Rebecca Hanson, Suzanne Frye, Shelly Anderson, Itinia Swafford, Ava Obert, Summer Obert, Debby Lively, Carol Scott, Brad Gilliland, Mollye Davis, Jack Gilliland, David Tinkle who receive instruction from Hada on the ASUMH campus. A native son of the Ozarks, Duane Hada, is both painter and passionate outdoorsman. Hada holds a BSE in art from the University of Central Arkansas and also has received certification from the Federation of Fly Fishers as an instructor, teaching both art and fly fishing at workshops, colleges and universities. Photographer James “Jim” Gaston is recognized for his creative outdoor photography. Gaston has donated numerous prints to the ASUMH college for students and the community to enjoy. The exhibit made its debut at the invitational 2012 Artsfest held in June at Bentonville, winning the McCoy Award of Excellence-Best of Show for the artists’ creative collaborations. Phillips and Noonan have combined their individual artistic talents to create mixed media works of art using the very best of clay sculpture and fiber art. Helen Phillips, professional potter, clay sculptor and teacher, said she has devoted her life to art. She graduated with a B.S. University of Memphis, 1961, and a M.F.A., University of Florida, 1975. Phillips has been working in clay for over fifty years, teaching ceramics at many different places including the University of Central Arkansas. She has worked with potters in Asia and Africa, and now resides in Arkansas where she can indulge in her love of nature, which greatly influences her art. Nationally known artist, Kristy Michele Worthen, is a multi-talented artist working in several mediums. She feels her artwork is both thought provoking and mysterious, and her paintings give the viewer the opportunity to see and feel things through a different perspective. The artist said she is influenced by such renowned artists as Picasso and Van Gough. Worthen said many of the ideas for her work are derived from everyday life, her dreams and visions. Worthen took an early interest in art and has spent her life painting and helping others. Diagnosed with bipolar disorder, Worthen has made it her mission to raise awareness about mental health issues through her art and related events. Her creation of a special flag serves as a symbol of hope for all people who have been diagnosed with a mental illness. The flag, which bears the symbol of a lighthouse, has flown over 20 state capitols and the Old District Office in Washington, D.C.
Zarate uses a flowing and dynamic style to express her spiritual nature and views her paintings as windows into other worlds. She floods the canvas with the essence and richness of fantasy or dream-state worlds, a bit of mystery and illusion, supported by strong composition. The artist said art is an all-consuming passion for her. She considers the act of painting a form of meditation and is as interested in the process as much as the finished piece. Zarate’s art has graced galleries, exhibits and juried shows from California to New York throughout her life-long career, including locally, where she also has been a juried artist in the 2011 and 2012 The Art Odyssey, an annual studio tour of selected artists in Baxter and Marion Counties. Beau Anderson, flame glass, is a student of all things creative, but pursues the elegant fluid expression of flame worked soft glass sculpture and glass bead making. He has demonstrated flame working arts in Europe and at his home in Stone County, Arkansas. Linda Armstrong, sculptural clay and figurine artist, takes a lifetime of study with master artists in porcelain and stoneware clays and creates heirloom quality porcelain lace draped figurines and sculptural art. Her award winning creations are recognized for their realism of historical era fashion, delicate detail and the combination of soft and bold colors. Armstrong’s work is has been included in juried and non-juried exhibits and graces galleries and private collections. Duane Hada, painter and passionate outdoorsman paints from the heart to capture a special time and place in his watercolor and acrylic paintings of what he considers the unique wild and beautiful place that defines who he is and what he paints. Sage and Tom Holland, glass flame art, are influential pioneers to the new wave of bead making. The results of their endeavors into the ancient craft of winding molten glass onto a rod that is then released, produces beautiful perforated wearable jewelry. The couple have provided class instruction in the art across the United States, Germany, Italy, Turkey and Canada and they both teach at the Ozark Folk Center and the Arkansas Craft School in Mountain View. Robert Patrick, blacksmith, and Mary Patrick, fiber and mosaic glass artist combine their talents in many unique pieces using Bob’s blacksmithing and Mary’s basket artistry to create original baskets, or his abilities in hand forged metal combined with her mosaics for beautiful art work and accessories for the home. Joellen “JP” Rosenquist, silversmith, has been a serious student of the arts most of her life. She began her apprenticeship with a Navajo silversmith in New Mexico in 1975, and has been designing and making original silver jewelry since. 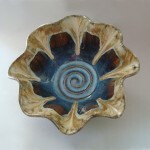 Liz Gamelin, potter, creates both wheel-thrown and hand-built pottery and expresses her love of nature and gives her work an organic “feel” in both her functional and sculptural pieces. Inspired by nature, the artist adds embellishments to reflect that inspiration in her creations. Deborah Lively, painter, photographer, illustrator and author. Her work has received numerous prestigious awards and is included in private and corporate collections throughout the United States, Europe, Canada and South America.The Donald W. Reynolds Library in Mountain Home purchased two of Lively’s pastels for its permanent collection. Deborah Mitchell, ceramist, is a sculptor working predominantly in high fired stoneware. Mixed media components, such as metal, glass and found and manufactured objects, are often included in her Warrior and Shields series. Her works give emphasis on clay’s inherent properties and is considered the primary motivator for discovering the expressive form within the raw material. 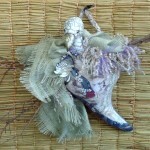 Michele Noonan, fiber artist, creates unique, functional fiber and mixed media art, such as intricately pieced wall art, handbags and totes, many incorporated with beads, lace and other materials that add to the item’s beauty. Her work is heavily influenced by her mother, who was raised in Puerto Rico and grew up in a culture where women were taught to sew by hand. Helen Phillips, professional potter and clay sculptor, has devoted her life to art, working in clay for over 50 years, and teaching ceramics at many different places including the University of Arkansas. She has worked with potters in Asia and Africa, and now resides in Arkansas where she can indulge in her love of nature, which greatly influences her art. Meggan Worster, photographer, uses her natural talent to give a unique perspective and artistic expression to a wide variety of subjects, including people, animals and landscapes. She applies her skills to three-dimensional art and jewelry photography for artists’ portfolios. Her award winning photographs grace galleries and private collections, and have been included in juried and non-juried exhibits. Ava Art Guild and Gallery, of Ava, Missouri, promotes art appreciation and education of all types of art in the Ozarks including 3-D art and photography along with traditional art-forms such as painting, drawing, and more. Organized in 1978 by local artists, the Ava Art Guild has developed a community appreciation of art through art education classes, meetings, workshops and exhibits. The all volunteer organization is an active group of nearly 100 members. The Art Gallery, housed in a building owned by the Ava Art Guild, is a permanent gallery for the display of member’s art throughout the year, along with two judged art shows a year, and is the location for monthly meetings and workshops. The Exhibit featured a selection of artworks by Ava Art Guild members including paintings, pottery, basketry, stained glass, art collage books, and photography. Artist Duane Hada, who paints what he knows best – the Ozark landscape, its flora and fauna; Kathy DiGiacomo, who creates beautiful landscapes and florals; along with Jerry Preator, whose exquisite work in watercolor is renowned throughout the Midwest will be among the artists participating in the exhibit. The exhibit also included artists Deborah Lively, Jeanne Roth, Sandy Barksdale, Jeanne Engeler Bachman, Virginia Haines, Sharon Berfanger, Cynthia Joy Malenshek, and Rhonda Doerr. The exhibit included over 30 watercolor paintings. Cynthia “Joy” Malenshek, “mostly a self-taught painter” in water colors, oil, and other media, and has received awards for her original works. Earline Pruitt works in several media, but favors pastels and has received awards for her painting through local art shows. Victoria Raub works in acrylic, watercolor, oil and pastel. Janice Elliott paints in watercolor and pastels which have won many awards and are included in private collections in the United States and Europe . Joanne Forbes has painted or created in some form most of her life and enjoys acrylics, pastels and gourd painting. Lisa Gordon enjoys taking art classes and workshops and favors pastels. Joyce Hitch paints in oils, watercolors, pastels and acrylics, often combining pastels, acrylics and watercolors as a mixed medium. Leah Bustamante Kelley, photographer and artist, enjoys pastels and has two award winning pastels being exhibited in the Capitol Building in Washington, D.C.
Bonnie Heenan has studied art and art appreciation in Paris, France and has been highly recognized for her works in a variety of media. Kathy DiGiacomo has received many awards for her work, including the coveted Grumbacher Award. Virginia Haines is primarily a watercolorist and her works have earned her artistic recognition. The three-artist exhibit, by Anni Worster, clay artist, Meggan Worster, photographer and Linda Armstrong, lace-drape artist is a written and visual art exhibit including original stoneware and porcelain vessels, portraits and porcelain lace-draped figurines. The theme throughout the exhibit is the inner strength, indomitable strength and courage of women as they go through life, accepting life’s challenges and overcoming hardships, adversity and heartbreaks, “fighting like a girl,” with faith, love, hope, charity, grace, determination and a warrior’s heart. Ann Worster, clay artist, incorporates in her expressive stoneware vases the vision, figuratively speaking, that we are each born a ‘vessel,’ and we each wear an outer protective shield or ‘armor’ throughout our lives. Meggan Worster, photographer, lends her unique perspective and artistic expression in very special portraits depicting the outwardly softer and feminine side of the females of our society at different ages and how inner beauty shines outward. Linda Armstrong, porcelain artist, contributes intricate porcelain lace-draped figurines, depicting the outward femininity of women and girls comparing the delicate porcelain clay to the fragility and beauty of women, but inwardly strong of heart. Davis, an accomplished abstract artist, expresses her unique view on aspects of life in her paintings. It has been said of Davis that she has the ability to take one along through her paintings on a magical walk through land-and cityscapes, with the ability to smell the fragrance of flowers in the air, or feel the warm summer breeze on one’s skin. The artist’s Dancer and Angels Series involve flowing twirling skirts with spinning dancers, and angels, with or without wings. The Memphis, Tennessee born painter’s career began about eight years ago not so much as an unfulfilled childhood dream but as an adverse allergic reaction to spending the greater portion of her day in a beige cubicle, which began the search that lead her to art and an exploration into color, texture, composition and design. Davis’s work has been exhibited throughout the southeastern United States, and she has had solo and group shows at Defoor Center, in Atlanta, The Albany Council for the Arts, Fort Valley State University, Phoebe Memorial Hospital, Turner Center for the Arts and the Georgia National Fair. She is a member of the International Society of Acrylic Painters and The Women’s Caucasus for the Arts and is featured in the area’s 2011 The Art Odyssey Tour. At a glance, one is invited into the art of Sidney Marks Nisbet and compelled to stay awhile, captivated by the images of nature, merged and superimposed layers of exquisite photographs to become collage-like images. The effects become magical compositions of orchids and moon, or any combination of natural subjects that also produce that magical quality. Nisbet, a Chattanooga , Tennessee native, now a resident of Melbourne , Arkansas , uses her love of orchids, her flower gardens and appreciation of natural subjects to inspire her photographic creations. It is said of the artist that it is not uncommon to see her stopping traffic or standing in a knee-deep pasture to get that perfect shot of a tree, which is then transformed into a moody and dramatic presentation. The artist’s career began early, with her first exhibition experience at the age of 13. Her education includes the Chicago Art Institute and the Washington University School of Fine Arts. Her career has included working for Hallmark Cards and Lenox China , and free-lance designing for Corning , Sears, Taylor, Smith and Taylor and others. Nisbet has spent a lifetime painting, including during her commercial art career. Nisbet’s artistic nature lead to the discovery of the amazing world of orchids, and she has spent 30 years collecting, exhibiting, competing and ultimately hybridizing her own crosses of the exotic flower, even becoming known across the South as “The Orchid Lady.” That discovery, along with “a consuming interest in photography with a heavy emphasis on nature” is seen in her photographic creations. The art exhibit will honor Phyllis Bailey, who passed away May 15, 2010, after a lengthy battle with leukemia. Bailey enjoyed painting and drawing in all mediums from watercolors to oils and charcoal. The artist’s paintings grace many homes and businesses in the Memphis and Mountain Home areas. Her works also include the original art for the ASUMH annual cards. The Memphis-born artist grew up in Osceola. She attended the University of Memphis, where she received a Bachelor’s Degree in Art History. She also met Jim Bailey, while attending the university. They were married on July 18, 1967 , and raised two sons. Bailey also attended Arkansas State University in Jonesboro , Arkansas , and received a Masters of Art in Studio Painting. Jim Bailey said the couple moved to Norfork in 1995, and later his wife became a member of the ASUMH faculty, teaching art history and studio classes. He noted that his wife was voted the Faculty Member of the Year for 2003-04, and served as president of the Faculty Association. In 2009, Phyllis Bailey received the Educator of the Year Award from the Mountain Home Area Chamber of Commerce. Charlene Blackburn is a well known artist from this area. Blackburn’s art is mostly contemporary pieces in watercolors and oils. Ozark Regional Arts Council (ORAC) held its monthly “Artist Reception” on May 16th at the Vada Sheid Community Development Center. Bonnie Heenan, a local artist, was present to visit with the public about her art on display till June 10th. The exhibit is a variety of oils, watercolors and photographs. Bonnie Marie Heenan has won awards for her portraits and other art for two decades. The collection of former State Rep. Vada Sheid includes one of Heenan’s paintings, a still life in oil, and there’s one hanging in the capitol building in Charleston, W.Va., among many other places.